I’m the WriMo Robot – who is insane! So, I just have to brag and gloat, and I am not getting around to this only due to my hands totally hating me yesterday – although I got over it, and signed through the issues last night (ran into a friend of a friend who knows ASL and we kiiiiiinda went to town – what a blast that was – only signing back and forth. Totally amazing). Just wanted to share that achievement with you all! And omg, before I leave, I have to share something else, and I do have a picture that I will include as well. 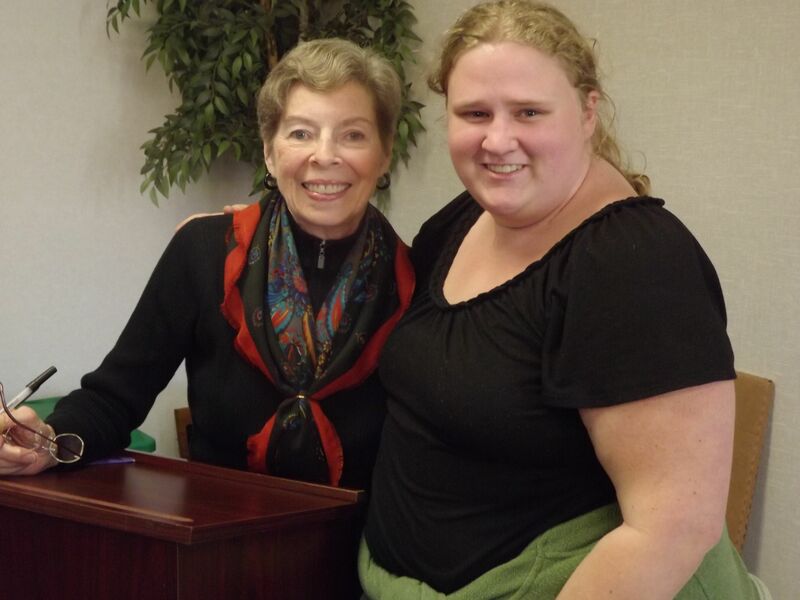 SO this past week – well Tuesday the 6th through Thursday the 8th was Pride Days on my school campus and one of our presenters that we had was Ann Bannon – the Queen of Lesbian Pulp Fiction from the 50’s – and she came to give a presentation and I managed to get a picture with her!!! Freaking amazing! All around, it was a great week – an insane week – filled with lots of awesome memories and accomplishments. It is most definitely possible to do around school, while being sick… it’s just harder, but not impossible!